Believe it or not I come from royalty. We even had our own castle. The gaunt ruins of Dunluce stand in splendid isolation upon a rock rising sheer out of the Atlantic and the Castle has been praised and described by Sir Walter Scott in one of his novels, but under another name. Details as to the actual building of the Castle are lost in the mists of antiquity, but it was in the hands of the English in the fifteenth century, and in 1580 it had passed to the McQuillans. Dunluce Castle in Northern Island was once home to the McQuillans. After a chequered career the Castle finally became the property of the McDonnells. Lord Antrim resided here until the rebellion of 1641, but a short while later one of the rooms fell bodily into the sea, carrying nine persons with it and the Castle was abandoned. It has remained a ruin ever since. Only two of the original fie towers now remain, McQuillan’s Tower and Roe’s Tower, so called after Maive Roe, a banshee or fairy spirit whose wail is still said to be heard during wintry storms. The banshee maintains her apartment scrupulously clean, in readiness for the return of the McQuillans. This remarkable ruin has been taken over by the Government of Northern Ireland as an “Ancient Monument” and guides are in attendance to explain its legendary and historic associations. The thought of Reginald’s fairy soothed her, and she fell asleep. This happened every night till McQuillan’s next visit. He, finding the room so clean, thought all was well, and exclaimed: “So the bridal robe is ready!” “Yes,” she replied, “my shroud is ready.” The words sank into his heart with a deep foreboding. He loved her, and was miserable at seeing her sad. He set himself to devise some plan by which she and O’Cahan could meet and escape without hurting his dignity or offending his kinsman. WOrd was to be got to Reginald that on a certain evening the Chieftan would be away, and Maive’s door would be unlocked. She knew nothing of this, and was that day particularly wretched. Towards evening she dressed herself in her white garment and stood at the window staring out. Suddenly, to her terror, she saw her father and his men leaving the Castle as for one of the bloody raids which were all too frequent. Surely, this time it was to kill her Reginald. Just then she heard her door open, and a low voice say: “Follow me, O’Cahan awaits you in the cave below.” No second invitation was needed. She followed, and found Reginald with a boat. They got in and pushed off intending to make for Portrush. The night was dark, a storm was gathering fast, and progress was difficult. Meanwhile McQuillan had returned to see if his plan had prospered. From the Castle wall he watched the boat struggling in the raging sea, and he could discern Maive in her white garment. Her words recurred to his memory. “The shroud! The shroud!” he cried, and dashing down to the shore he ordered his own boat to the rescue and offered half his goods to those who would save Maive. But all was in vain; human power was of no avail in such a sea and the last he saw of Maive was after the boat overturned and Reginald was trying to swim ashore with her at the White Rocks. Next morning Reginald’s body was found on the shore, but Maive was never seen again. The fairy, however, still sweeps her room. 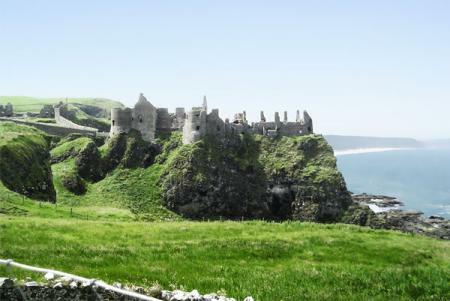 At a later date, 1635, after the Castle had passed to the MacDonnells, Randal MacDonnell, 1st Earl of Antrim, married the Duchess of Buckingham (widow of George Villiers, the Duke who was assassinated), and brought his bride over to Dunluce Castle where they lived till 1641. It was during this lady’s time that part of the Castle fell into the sea. One December evening while she was entertaining a large party of the neighbouring nobility and gentry, a strange rumbling sound was heard from the north side. All rushed out to see what it meant, and to their horror found that a large portion of the kitchen, with nine servants, the dinner, valuable plate, etc., had fallen into the sea. A tinker, who was sitting in one of the windows mending a kettle alone escaped. “The Tinker’s Window” is still shown to tourists. Under the cliffs is a hugh cave, by means of which the Castle was often provisioned in times of siege. The “Gallows Hill”, where rough-and-ready justice was administered by the Chieftain, stands close by. Gradually, after this the place fell into disuse and decay. While rushing whirlwinds sweep its roofless halls.